On this day of Baisakhi i bring you this typical punjabi recipe from the land of Punjab. Actually i got this recipe from a dear friend of mine Shobha Keshwani`s blog. I took a look at it and wanted to make it a little differently… So thanks to Shobha , who is a dear dear friend of mine ( we yet have to meet and give each other a hug) i just tweaked her recipe a teeny weeny bit and made it a little more “internationally”. For her PINDI CHOLA RECIPE click HERE. I served them with a whole wheat baked kulcha which i will also share the recipe. Grind the onions, ginger and garlic to a paste in a blender ( i used my bullet). Heat the oil/ghee in a pan and add the paste. Cook it over medium heat till it starts to stick…once it sticks to the bottom add a bit of water and continue to cook it till its slightly browned and the raw smell has gone. This is an important step…Try to use a good nonstick pan for this. While onion paste is browning grind the whole spices to a powder ( i used the spice jar for my bullet to do this). Once the paste is done, add the powdered spices, salt and red chilli powder. Then add the boiled chickpeas/chola/garbanzos and mix well. Lastly add the lemon juice to taste. Goes well with puris, naans or kuchas. I made a kulcha out of whole wheat flour and sharing the recipe below. Serve with onion rings, chopped coriander leaves and green chillies. Mix the yogurt and the soda bicarb and leave it for a few minutes. You will see bubbles, then add the oil, salt and the water. Mix well. Add enough whole wheat flour so you can make a dough out of it. Add the flour you need spoon by spoon till you get a soft dough. Put it in a covered container and keep in a warm place for about 3-4 hours. After that time, just knead it again, Make into balls. Roll out into rounds not too thin and bake in a hot tawa (iron gridle or pan) till slightly browned on both sides. Serve with your chickpeas. These kulchas can also be frozen. NITU DIDI TIP: For Jains, please omit the onion paste and just proceed. 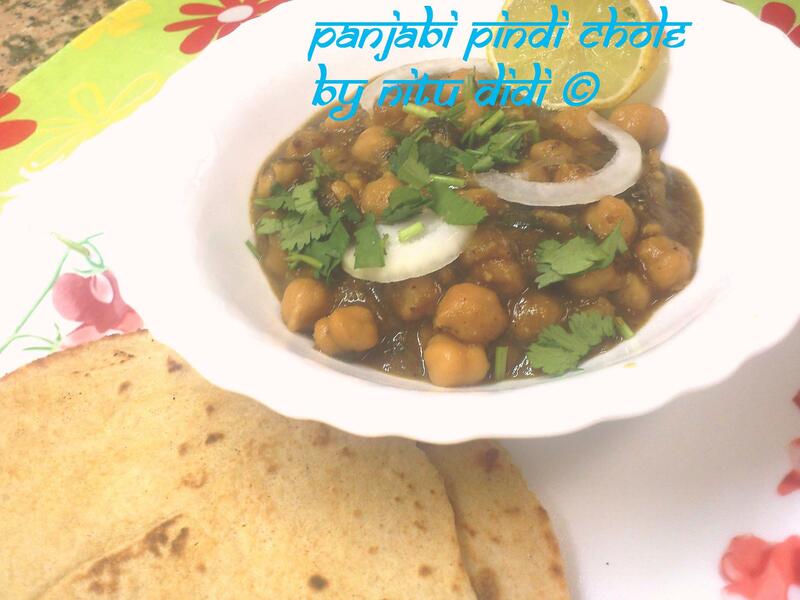 This entry was posted in Breakfast, Everything Vegetarian, Floury Matter, Fusion, Gluten Free, Healthy Options, Indian Restaurant Dishes, Jain recipes, Lentils, Low Cost, Magic Bullet, Nitu´s Spicy Delights, Quick Recipes, Veg Starters, Vegan and tagged bullet, chickpeas, chola, chole, garbanzos, healthy, kulchas, punjab, spicy, Vegan, vegetarian. Bookmark the permalink.